The Blackhawks won the Stanley Cup in 2013, and may very well have a chance at a repeat performance. After all, they retained much of their players, with Dave Bolland perhaps the only significant subtraction from the roster. 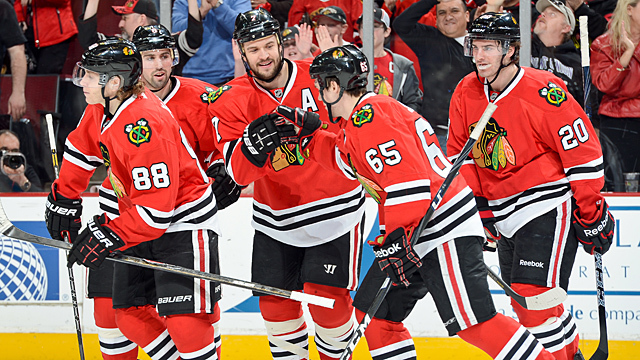 Brandon Saad, Nick Leddy and Marcus Kruger all seem ready to take on more responsibility. Especially with the hard salary cap and increased parity, it’s pretty darn tough to repeat in this league. The last team to be able to do so were the 1996/1997 and 1997/1998 Detroit Red Wings. As much as it hurts to say this, I think the Blackhawks are, once again, the team to beat this season. After a few seasons in the cellar, the Avalanche are slowly assembling a good group of players up front. Gabriel Landeskog, Matt Duchene, Ryan O’Reilly and Nathan MacKinnon are as good a young forward core as any team can ask for. Their defense is weak and their goaltending is inconsistent. There may be hope on the horizon for the Avs, but at least for this season, they’ll have to go through some growing pains. The Stars may have given up first-line winger, Loui Eriksson, to the Boston Bruins, but in Tyler Seguin, they received someone with no. 1 center potential. In the same deal, they also managed to get Rich Peverley, who has potential to produce as a no. 2 center. Jamie Benn, a 6’2″ forward who averaged 0.80 points per game last season, is an emerging star. 23-year old Alex Chiasson and 2013 1st round draft pick Valeri Nichushkin look like they will fill some key roles in the lineup. There’s not a lot of depth in the back end after Alex Goligoski, Stephane Robidas and Trevor Daley. 39-year old, UFA signing Sergei Gonchar will help, but other than that will rely on guys like Brendan Dillon, ex-Canuck Kevin Connauton, Jamie Oleksiak and Jordie Benn to improve. This may be a bridge year for the Stars. The kids will get opportunities to play and gain some much-needed experience. By signing Matt Cooke and trading for Nino Niederreiter, the Wild did well to improve their bottom-six. The top-six is top-heavy. After the no. 1 line of Mikko Koivu-Zach Parise-Jason Pomminville, the Wild will have to rely on youngsters, Charlie Coyle and Mikael Granlund, and hope that Dany Heatley can stay relatively healthy and able to chip in offensively. After making a big splash and signing Parise and franchise defenseman Ryan Suter last year, there was a lot of optimism in St. Paul to start the 2012/2013 season. Expectations should be more tempered this season. Goaltending and defense will, of course, once again be the Predators’ strong suit. They had Seth Jones drop into their laps at the 2013 NHL Entry Draft, and Roman Josi looks like the real deal. The Preds’ offense finished dead last in the NHL last year; this year won’t be any better. Sometime in the future, Colin Wilson, Filip Forsberg and Taylor Beck may well provide Nashville with the offense they need. Just not with any regular frequency this season. The Blues have incredible depth throughout their lineup and should once again be one of the hardest teams to play against. Already with David Backes, Alex Steen, Chris Stewart, Patrick Berglund and Vladimir Tarasenko, they went ahead and added Magnus Paajarvi from Edmonton and ex-Canucks, Derek Roy and Maxim Lapierre. Their defensive corps consisting of Alex Pietrangelo, Jay Bouwmeester, Kevin Shattenkirk, Barret Jackman, Roman Polak and Jordan Leopold may be the best in the league. The Blues have only won one playoff round – in 2011/2012 – in the last ten seasons. The Blues should easily make the post-season in the new Central Division, and certainly, they have the pieces to finally make it out of the second round of the playoffs. The Jets’ top-3 on d – Dustin Byfuglien, Tobias Enstrom and Zach Bogosian – can produce with the best of them. Up front, they added some depth behind Andrew Ladd, Evander Kane, Blake Wheeler and Bryan Little by signing versatile Michael Frolik and 20-goal man, Devin Setoguchi. Their defense isn’t that great defensively, playing in the same division as some very good defensive teams. The Jets should be able to compete for one of the Western Conference’s wildcard spots. Caption Action: What Was Brent Seabrook Thinking?